Exceptionally well put together and does a great job, there’s no reason why this shouldn’t cost more considering the level of quality that has been achieved here! Just works great straight on ! 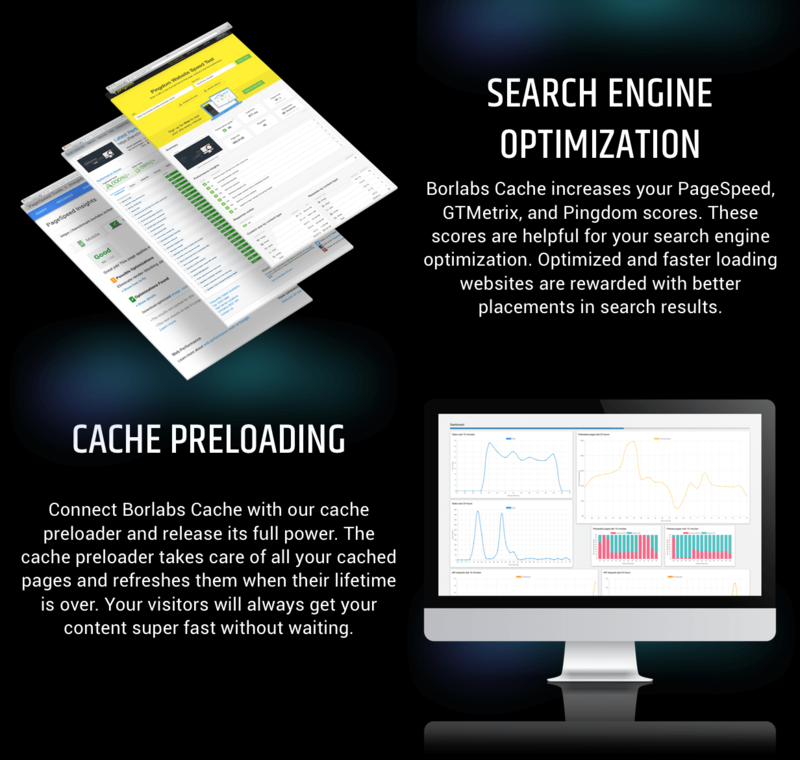 This is the BEST caching plugin out there, hands down! Don’t miss out, you won’t be disappointed. 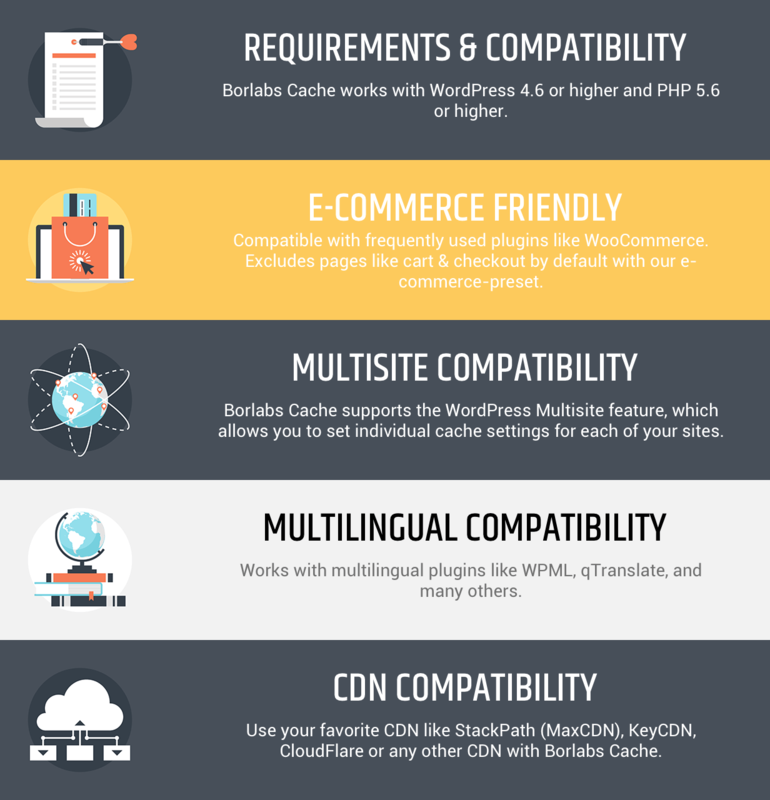 I’ve compared this against WP Fastest Cache and W3 Total Cache, and a few others, and time and time again, I’ve preferred Borlabs. Thank you Borlabs team! Very powerful plugin with lots of options for configuration. What I like the most is the fast support, helpful support and overall willingness to help me configure everything. Also, my site is now loading 5s faster. This cache is CRISPY; I didn’t expect it to speed up my site as much as it did! I love how simple it is to set up. Preconfigured settings are built into the cache to choose from depending on what type of website you have, though they still leave the flexibility to customize it how you like! 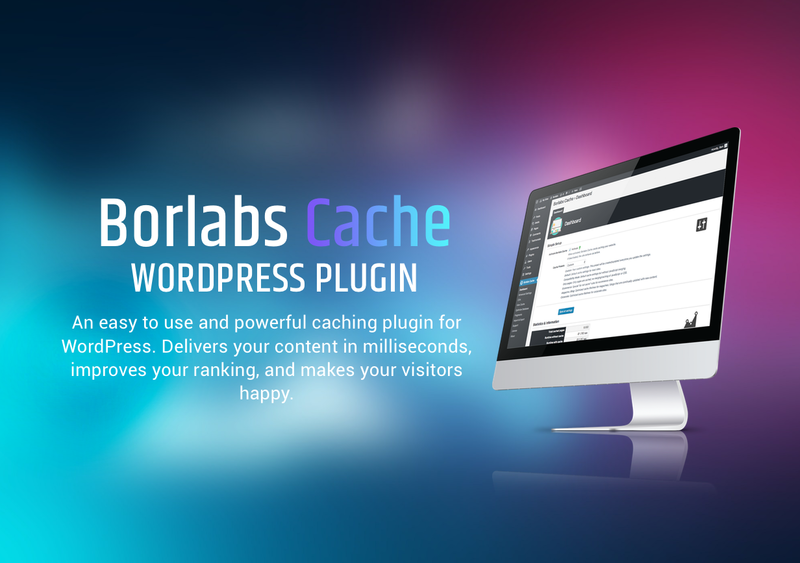 Borlabs Cache is – IMHO – the most flexible and powerful cache plugin available for WordPress. It comes with many features which are well documented and boosted my WordPress sites. As everybody knows: speed is also an important SEO factor. It’s suitable for all kind of users – from novice to expert. And it has several significant security features (strict transport security for HTTPS, content security policy header and much more). All my WordPress sites became “green” in Google’s page insight with values up to 88/100 only with Borlabs Cache (before: 30/100 or 40/100). GTMetrix values raised from 45% to over 90% without any CDN (best value: 98% page speed and 92% YSlow). I didn’t achieve these results with other cache plugins (and I tested them all). MASTERPIECE!!!!! I have tried all the top premium cache plugins out there and none of them gave me THIS much speed and THIS much customization options and ease. It’s just unbeatable in my mind because of the quality of code and because it guides you along and offers you features, that I, for one haven’t seen before, including working with nginx. BRILLIANT, BRILLIANT BRILLIANT!!!!!!!!! Excellent plugin with GREAT support!! Very professional and very fast! I advice this plugin to everyone!! 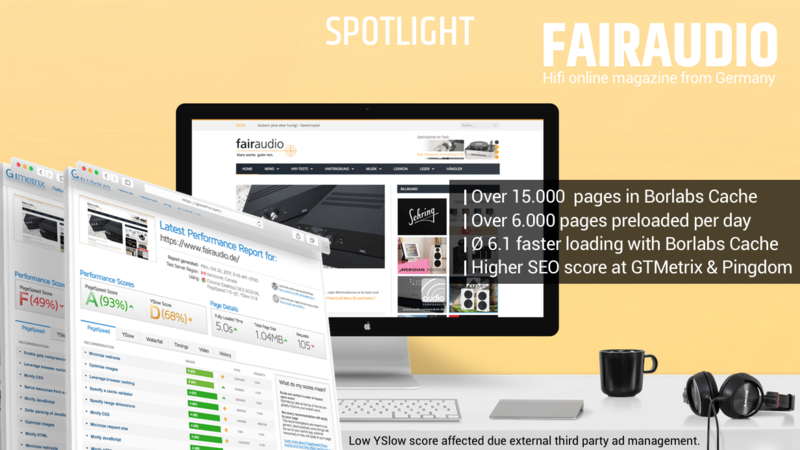 Pro: By simply enabling this plugin, my Google PageSpeed Insights score went from 70% (C) to 86% (B)! Con: Y’all really need an unlimited site license option. It can be a subscription, but $49/site is not ideal for developers that struggle with justifying things to stubborn clients (even if it is clearly worth it). My best investment on СodeHolder recently. TOP. Very good and efficient product. I didn’t find any issue which has not been resolved very very quickly by the Customer Support. The support is absolutely fast, regarding my experience all my requests have been answered within a day. Thank you very much and Keep going ! Great Plugin with excellent quality in features and programming. Very helpful support too. Had no problem installing it and worked right out of the box. Working like a charm! Havent measured the performance increase in ms yet but i can certainly feel the effect when testing across platforms. I will update this comment if necessary. I’ve tried all of the wordpress cache plugins on the market and I was not 100% satisfied. 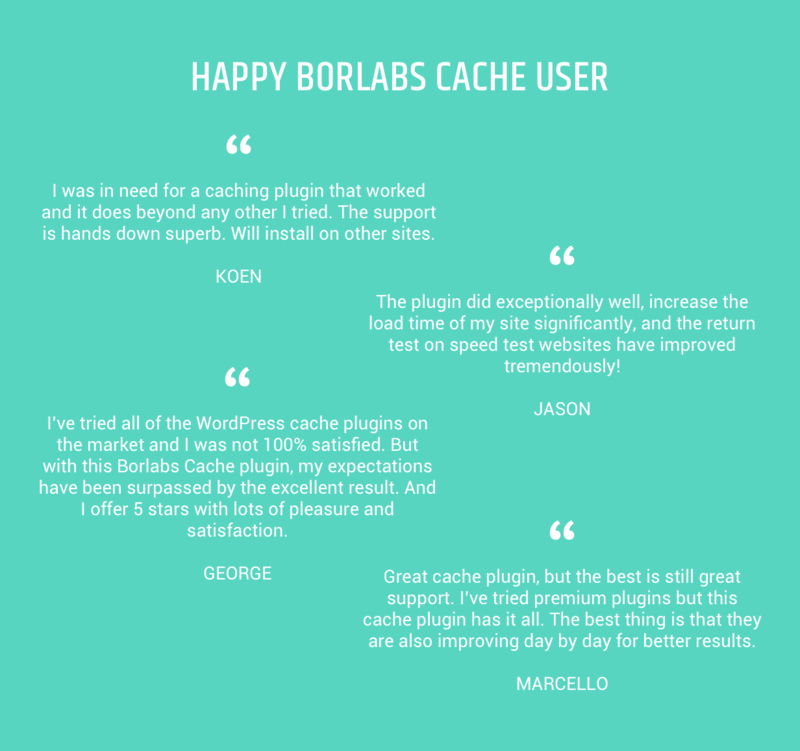 But with this Borlabs Cache plugin, my expectations have been surpassed by the excellent result. And I offer 5 stars with lots of pleasure and satisfaction. George from Romania! Great cache plugin, but the best is still great support, Ben is doing a great job. I’ve tried premium plugins but this cache plugin has it all. The best thing is that they are also improving day by day for better results. Hey, For pre-purchasers, i would highly recommend this plugin for a few reasons, 1. The plugin did exceptionally well, increase the load time of my site significantly, and the return test on speed test websites have improve tremendously! 2. Very good support, before purchasing the plugin, I’d contacted the author personally and request for assistance due to my site is live and i would require immediate assistance if it were to cause the site to break down. Author was willing to provide assist and guide me throughout, till the configurations are complete and results are proven. (even went to the extent to help me personalise the configuration based on the nature of my site!) 3. Furthermore, author went the extra mile to provide experienced general advice on my site and the functionality of the plugin. These are my personal opinions and experience i have with this author, and it was a great one. Hope this comment will increase more confidence in interested buyers on this plugin! Thanks again to the author! That’s good. Just 15 minutes and I got my support. And my site run well 🙂 Thank you. Let’s make it better. Card Slider — Ideal for a portfolio, presentations and many other applications where it is important to produce the effect on users. I have developed a web elements in these slides, which can be useful to you and your business. Namely: tags, menu for each card separately, Like and Share buttons.